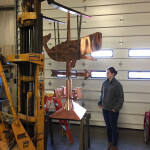 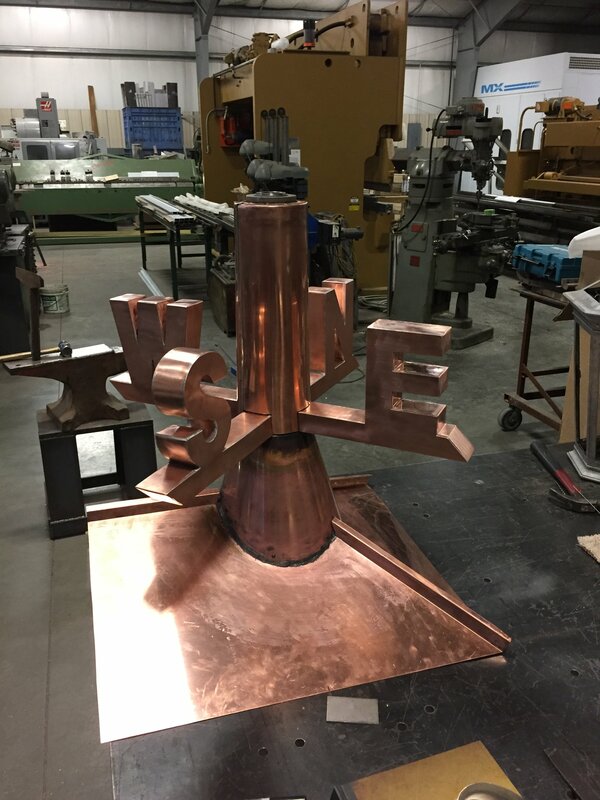 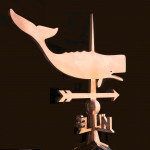 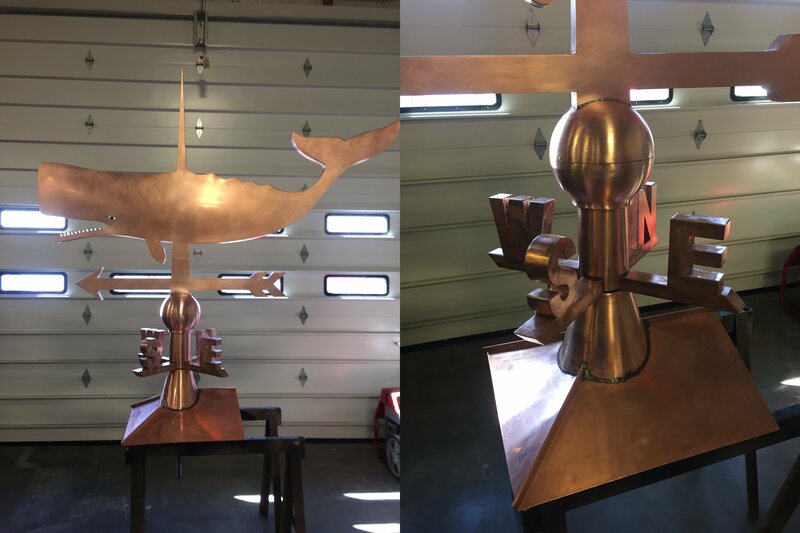 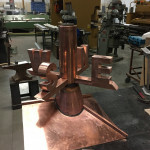 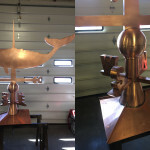 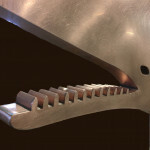 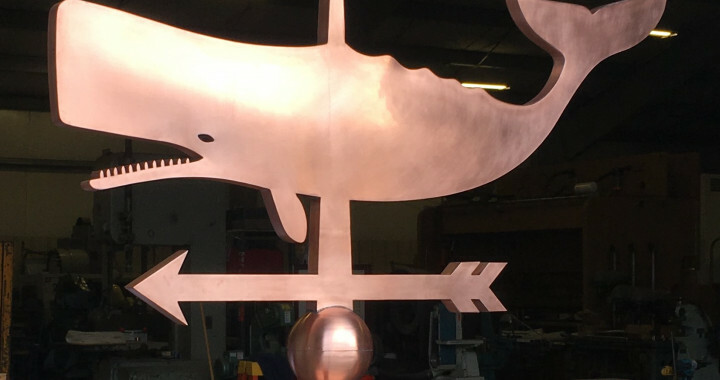 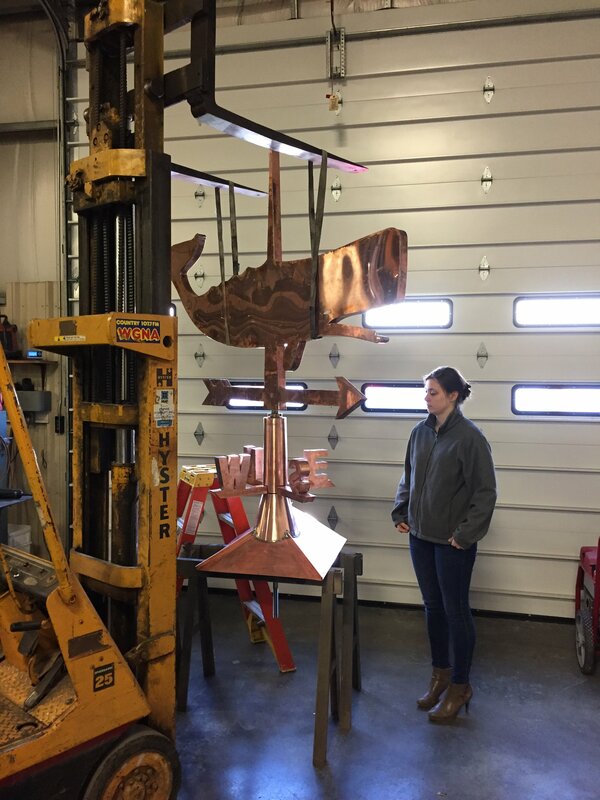 Custom Copper Whale Weathervane for a private residence in Cape Cod. 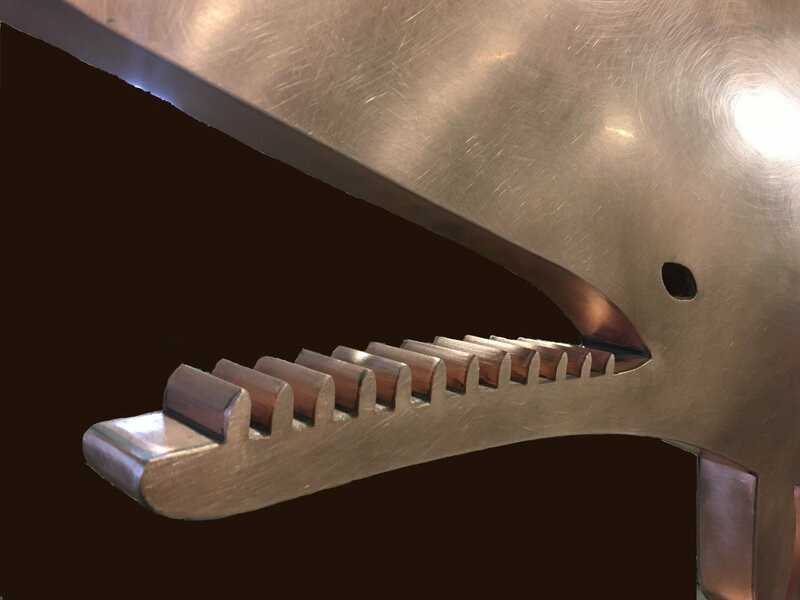 Now on to Willy’s dental work! 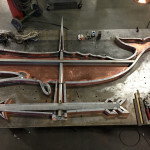 Once the excess sheet metal is trimmed and filed smooth Willy’s got a full set of choppers! 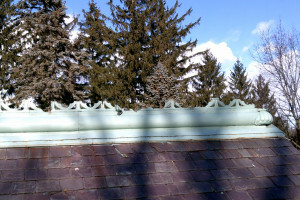 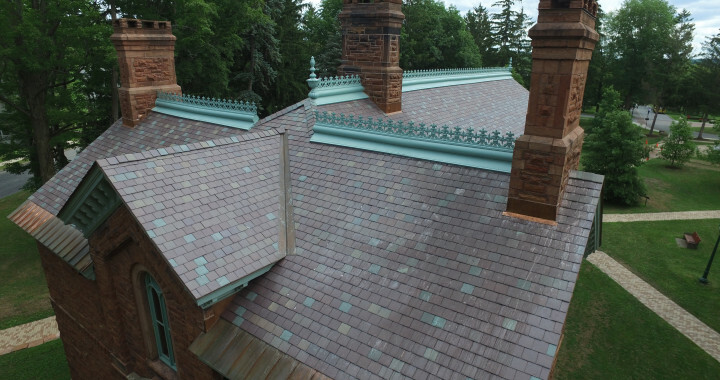 New Roof Crest: The new cresting was formed in 10′ sections. 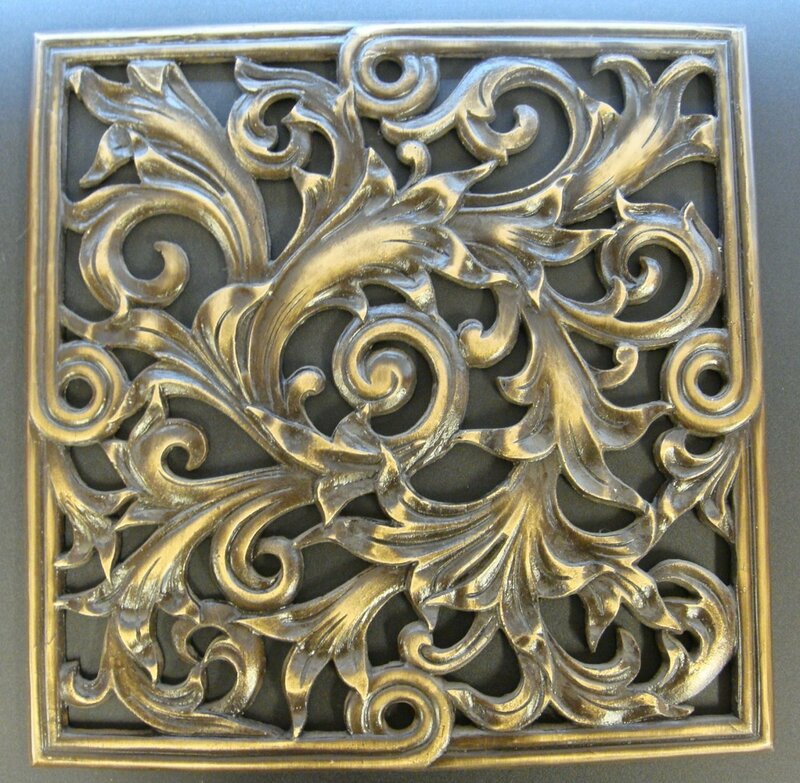 They were formed in two 3 dimensional faces and soldered together at the entire perimeter. 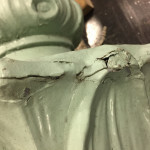 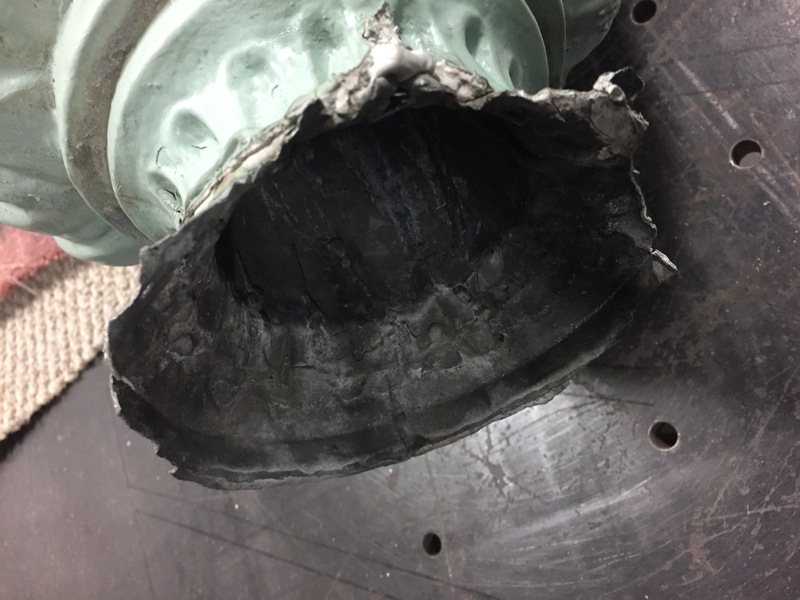 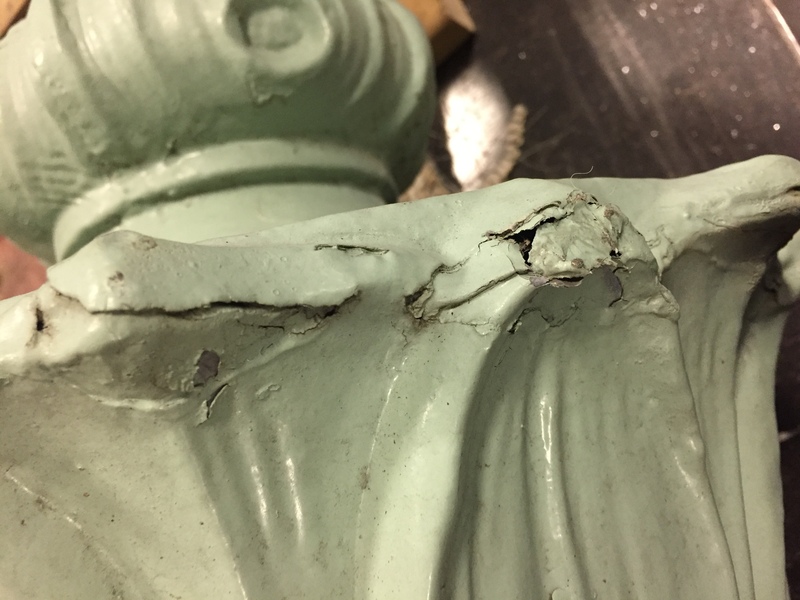 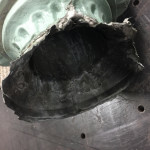 The original finial was rotted very thin and had numerous patches of tin, caulk, even spray foam! 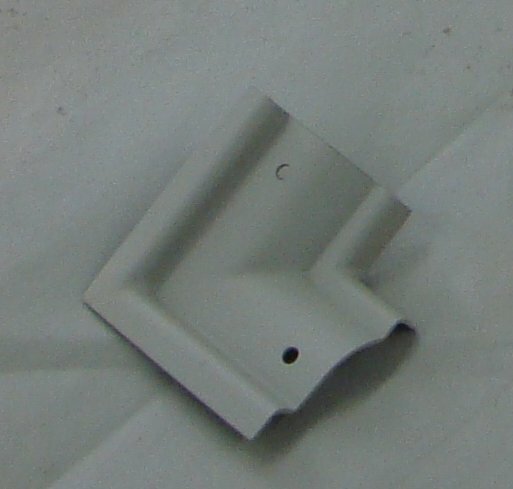 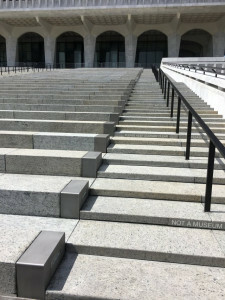 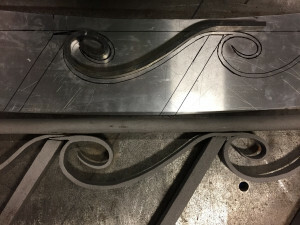 Where possible original sections are stripped and used to make hammerforms. 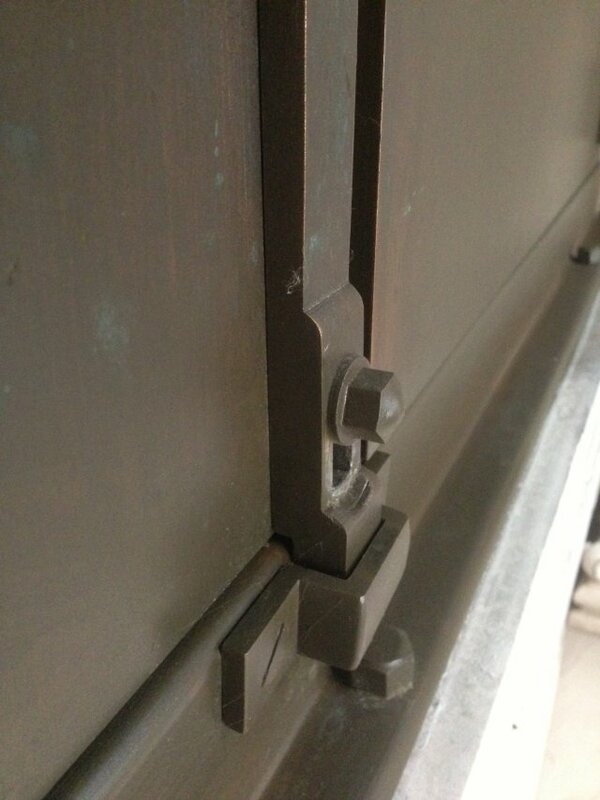 Sometimes we use both male and female hammerforms. 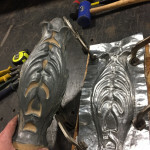 Repousse components are hammered out from the behind (female form) then details are chased back in from the front (male form). 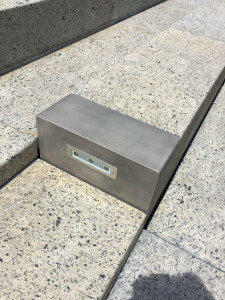 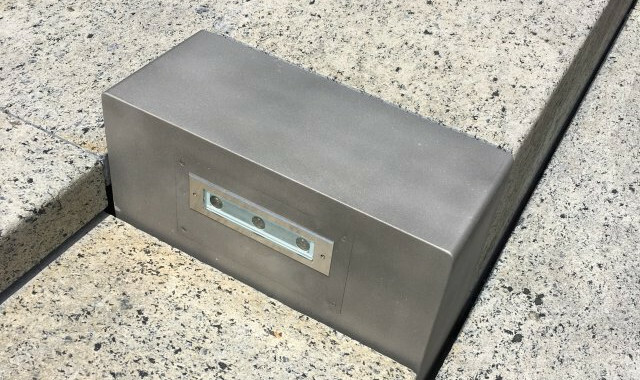 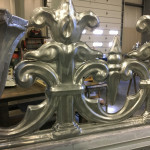 Completed, fully soldered zinc finial. 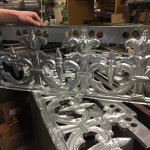 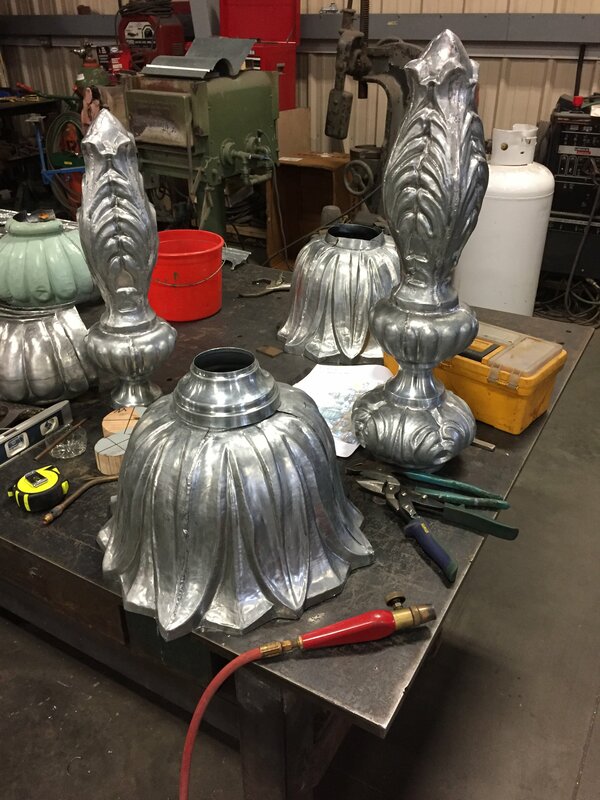 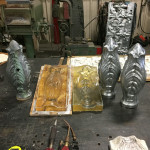 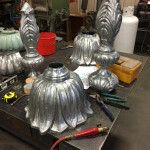 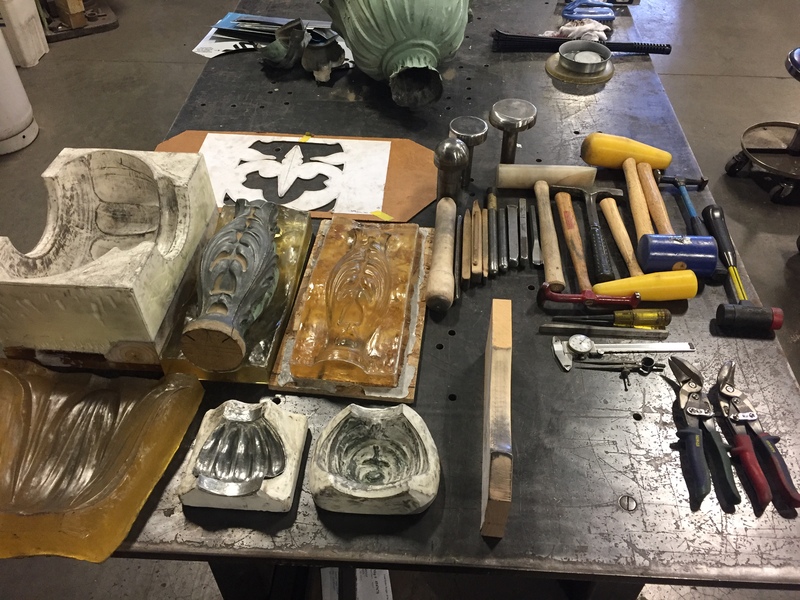 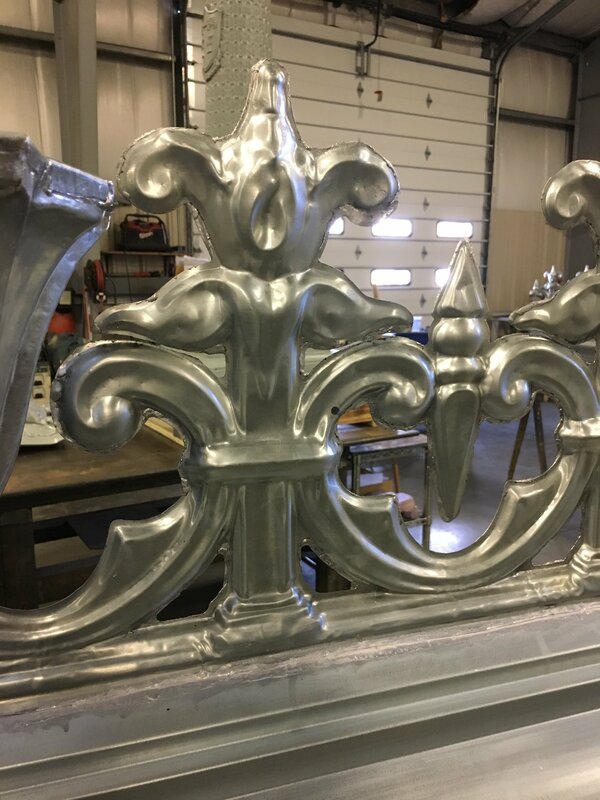 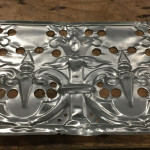 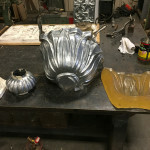 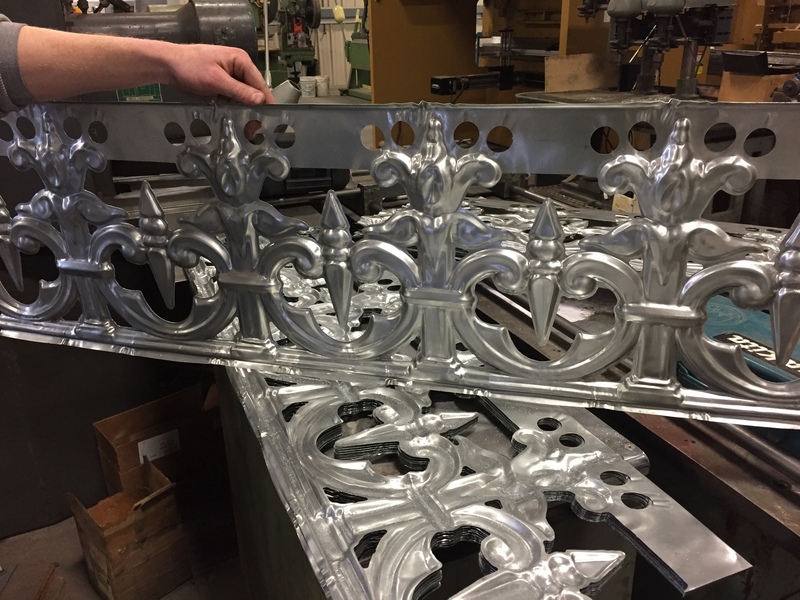 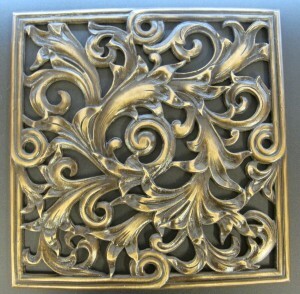 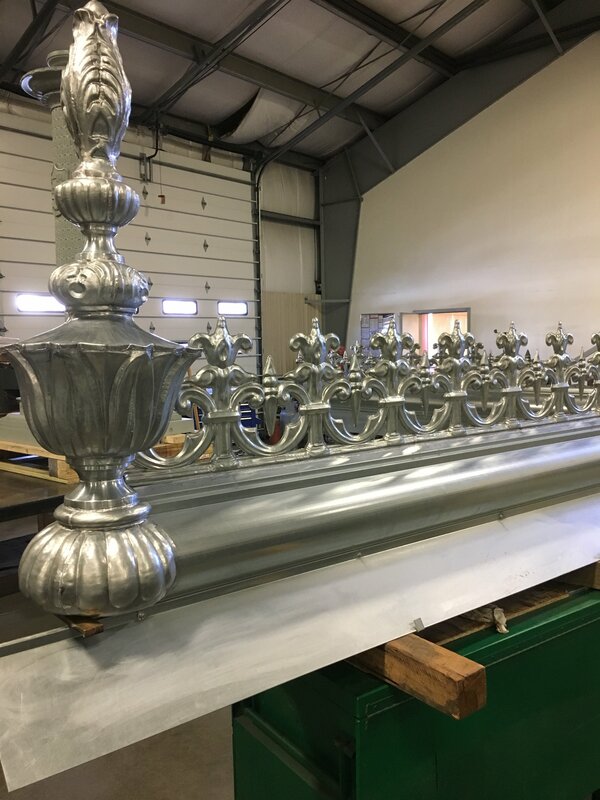 All components of this finished finial are hand formed “repousse” and soldered together into one unit. 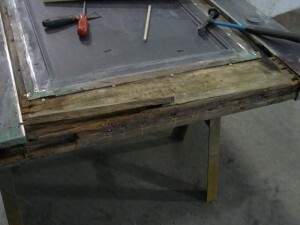 This picture shows previous inadequate attempts to fix the scrolls. 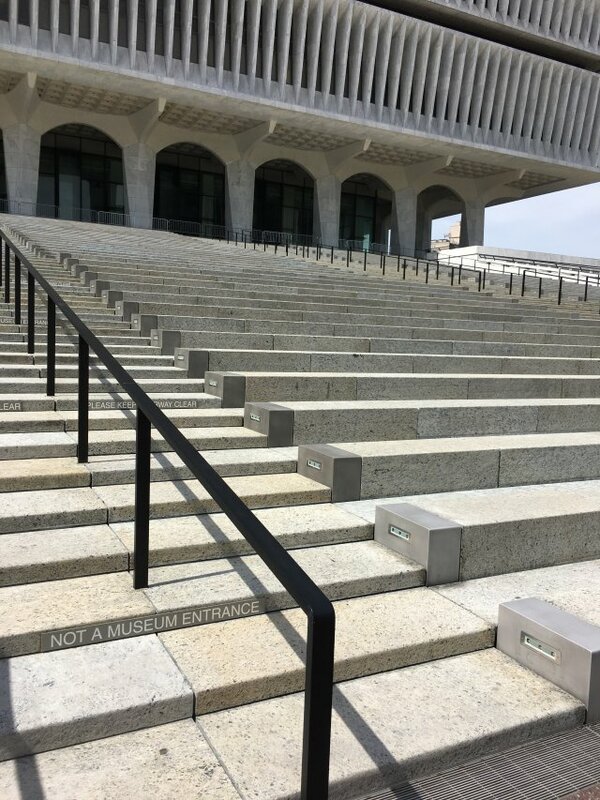 They are not true to form. 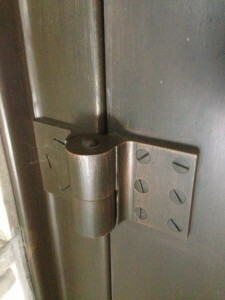 They are bolted on. 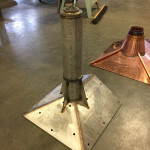 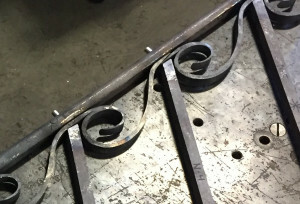 The pickets are arc welded. 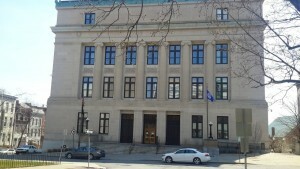 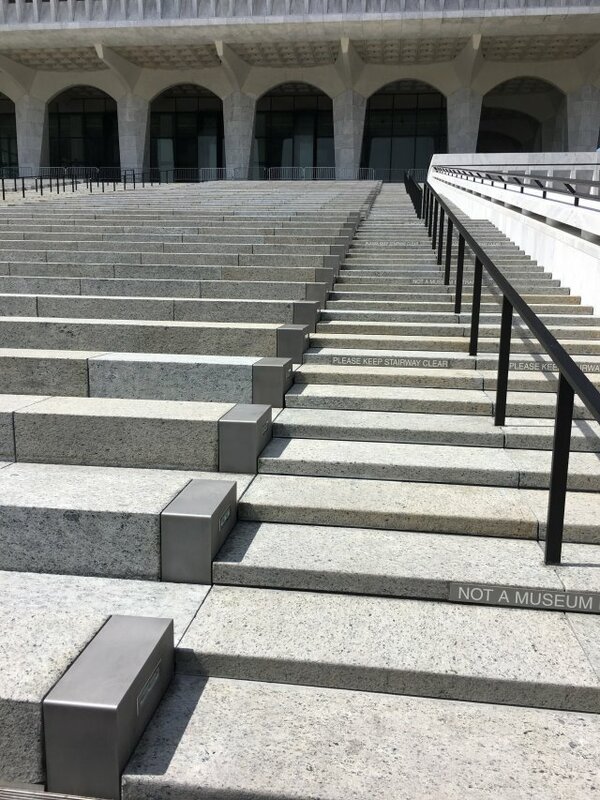 The original tenons are broken or missing. 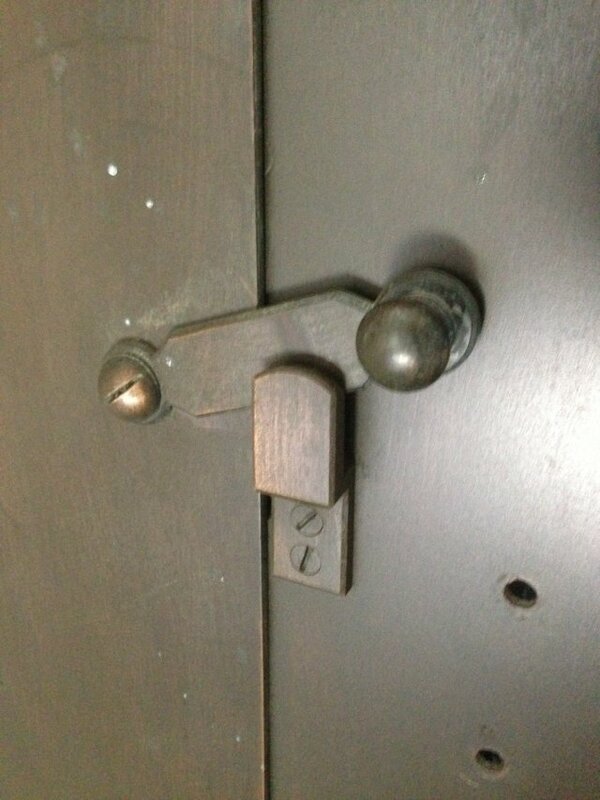 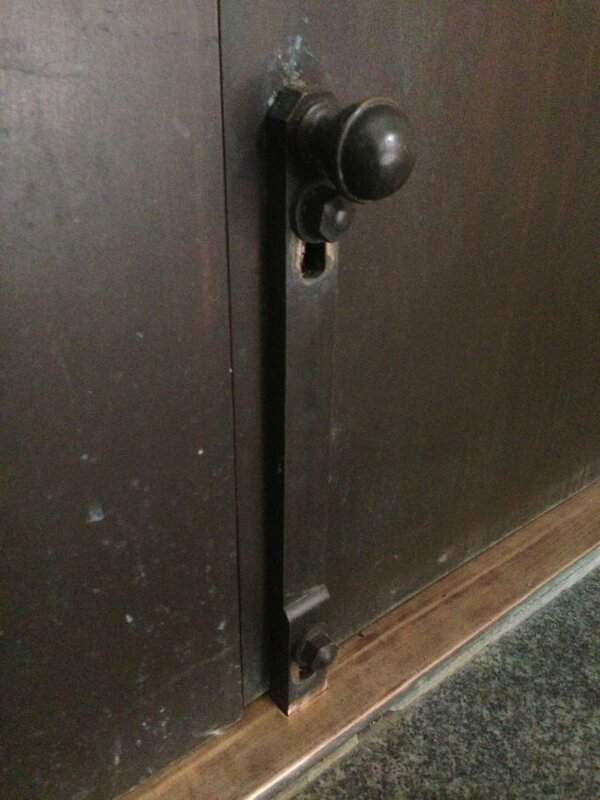 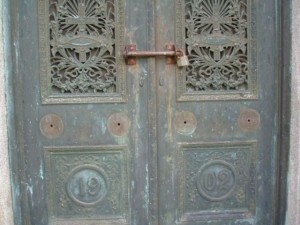 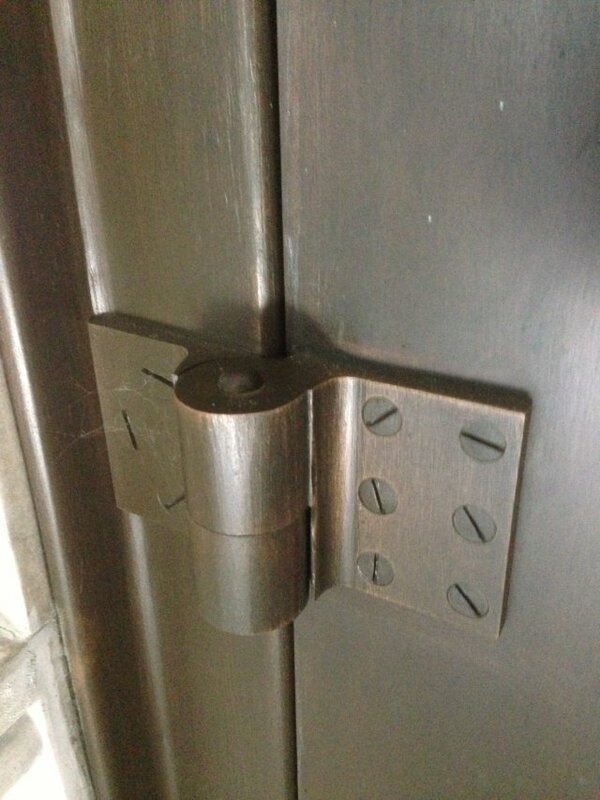 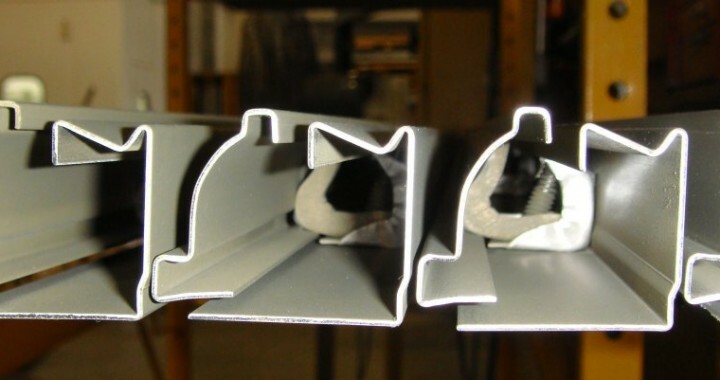 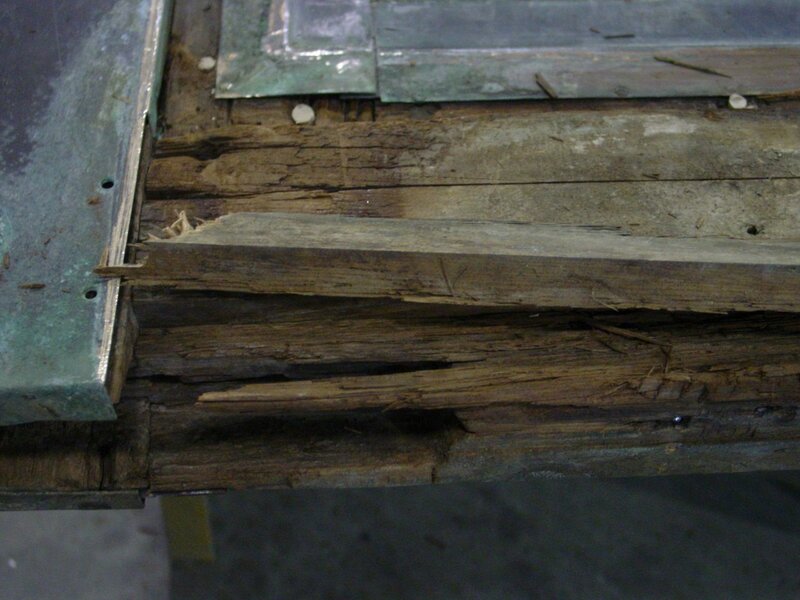 Most of the mortise holes are split from rust. 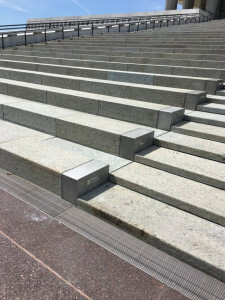 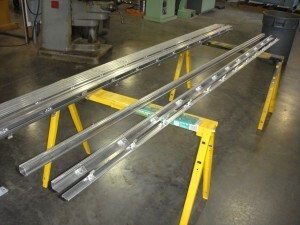 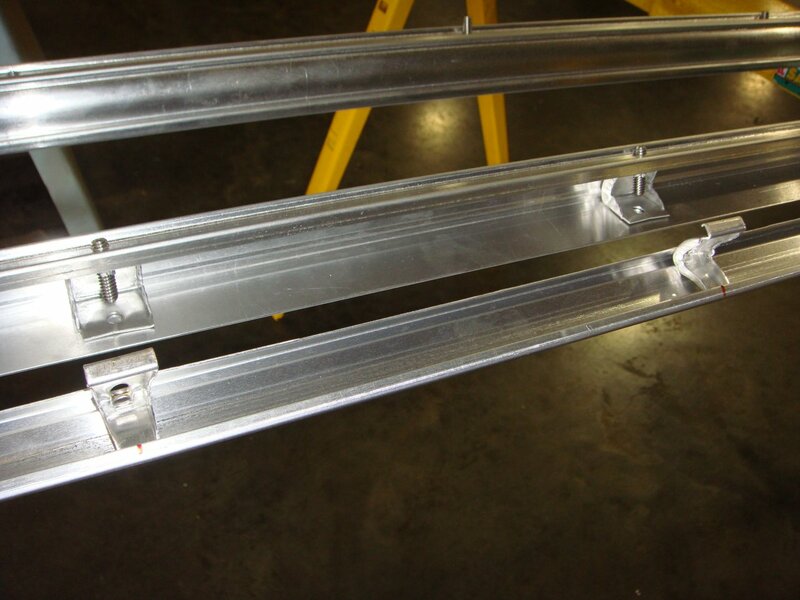 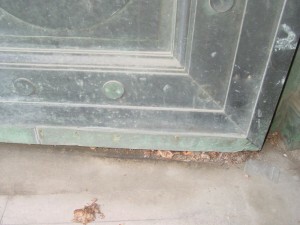 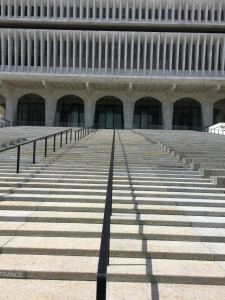 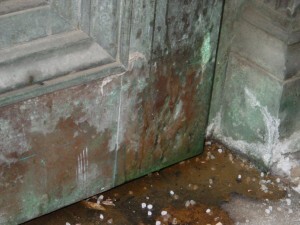 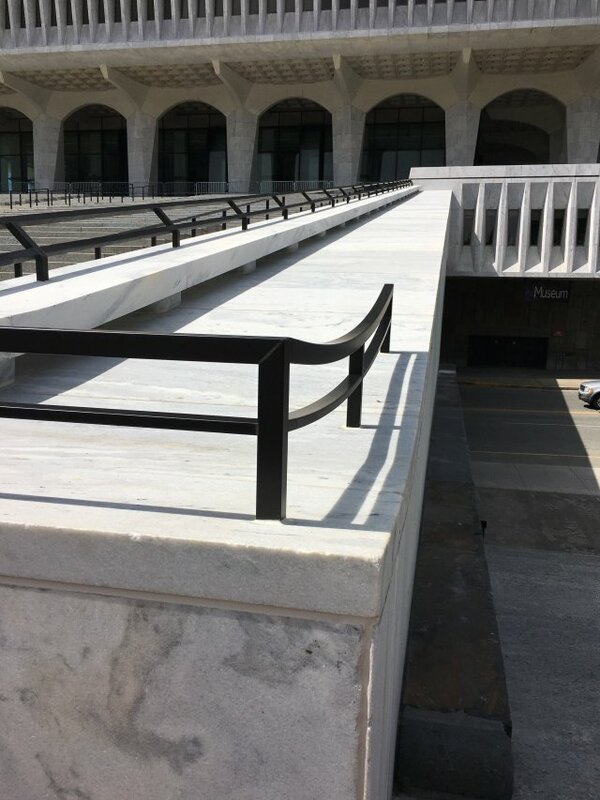 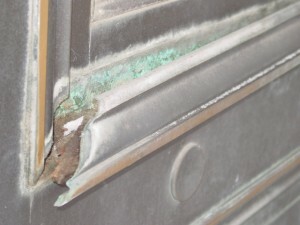 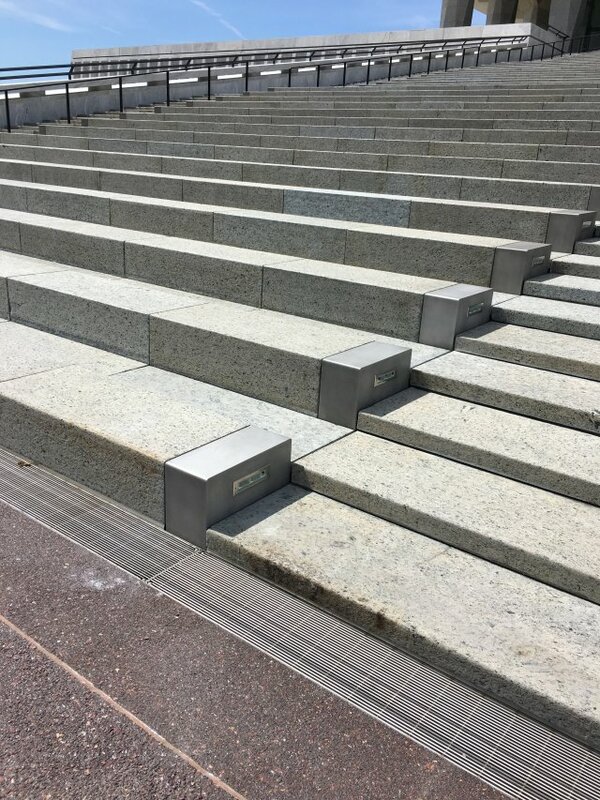 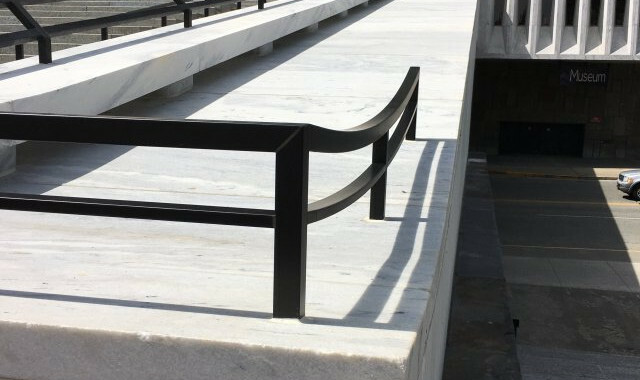 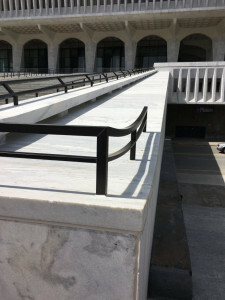 Previous repairs to the splits were done with improper materials and methods. 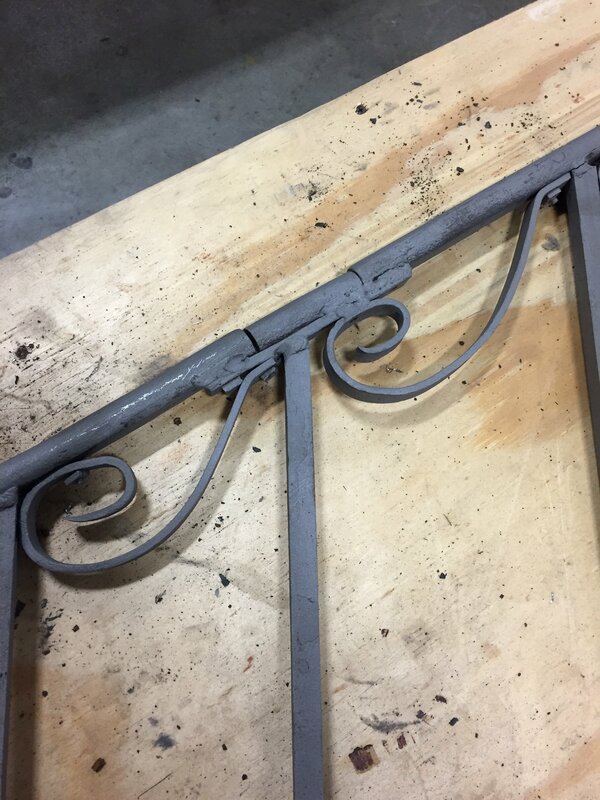 We smoothed the scroll. 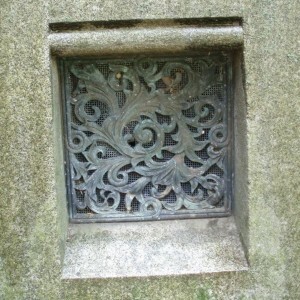 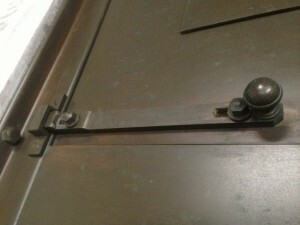 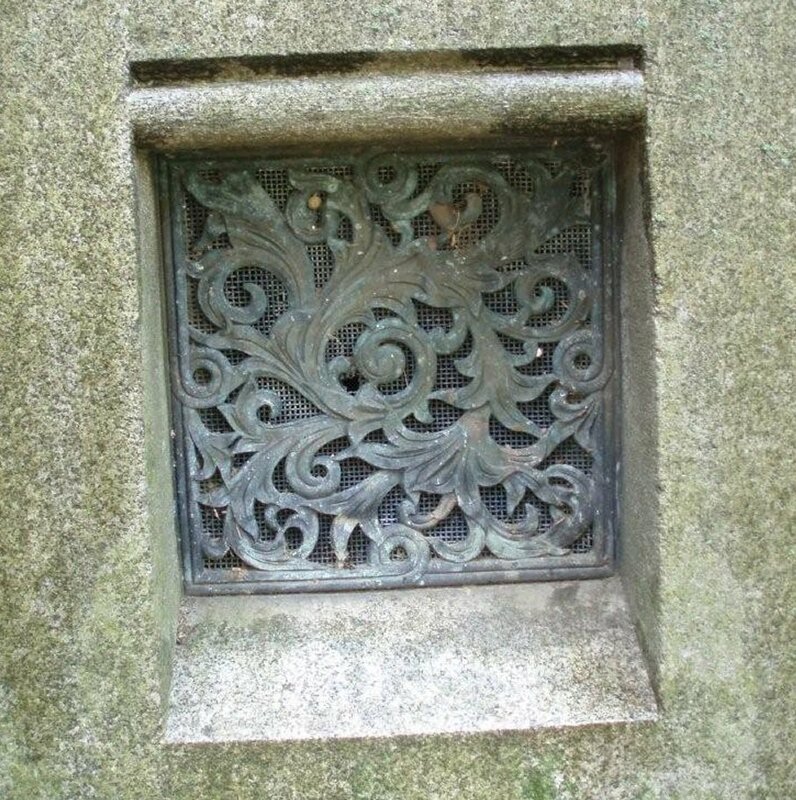 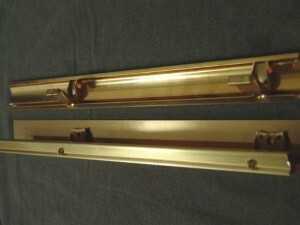 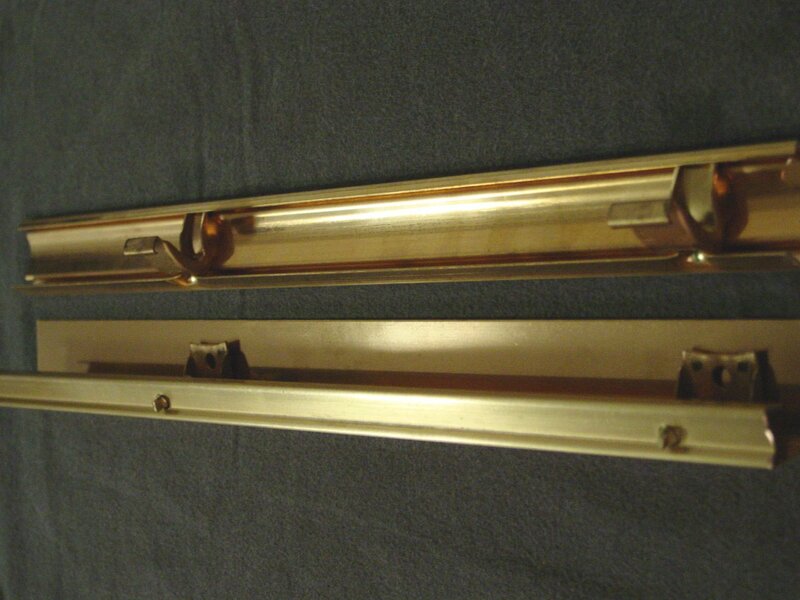 Gouged metal on both the rail and scroll have been restored. 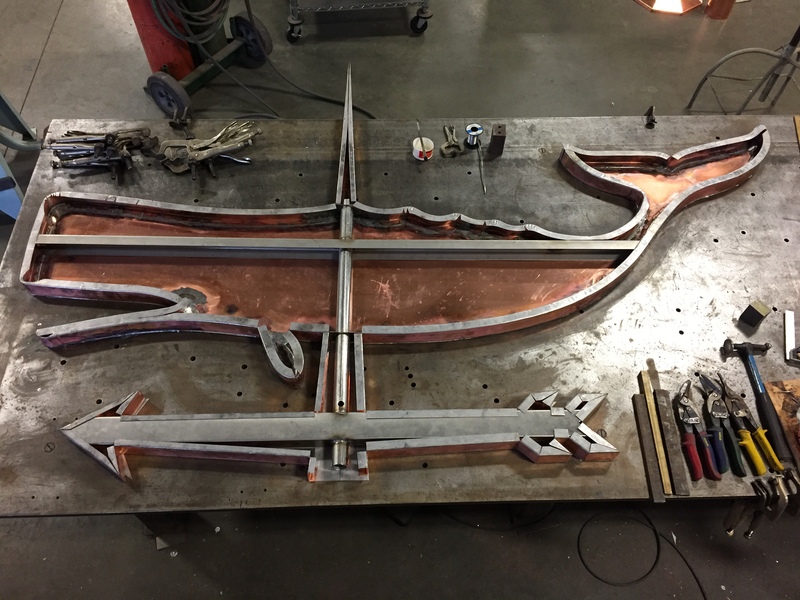 Forged and welded a new tail. Visible is the picket with the end restored with the new tenon. 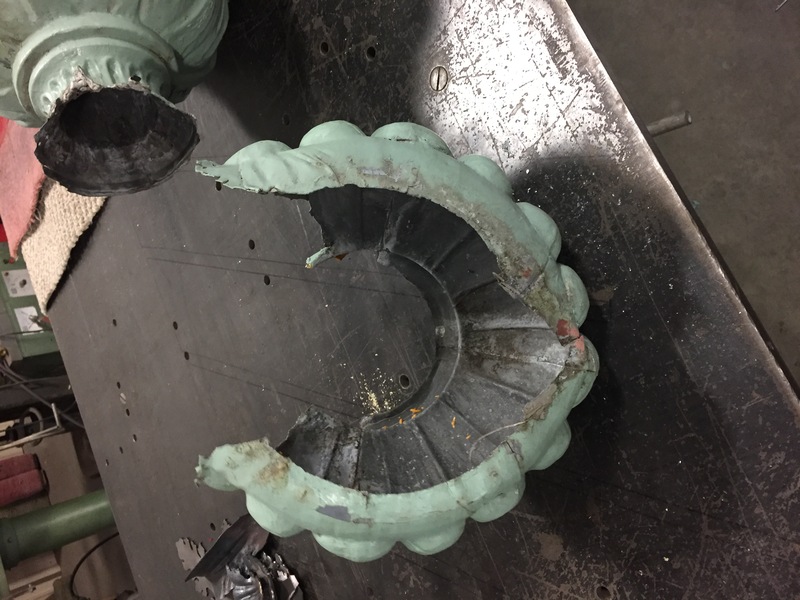 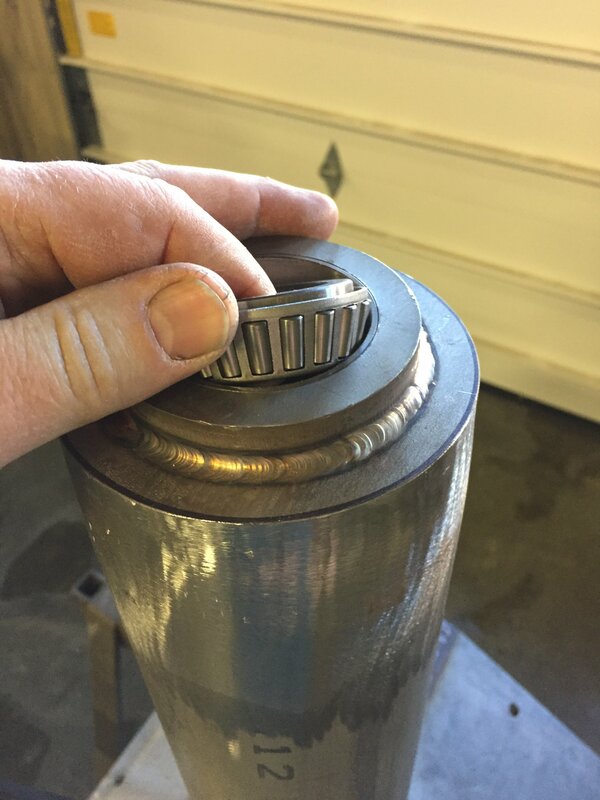 Original scroll that had previous repairs. 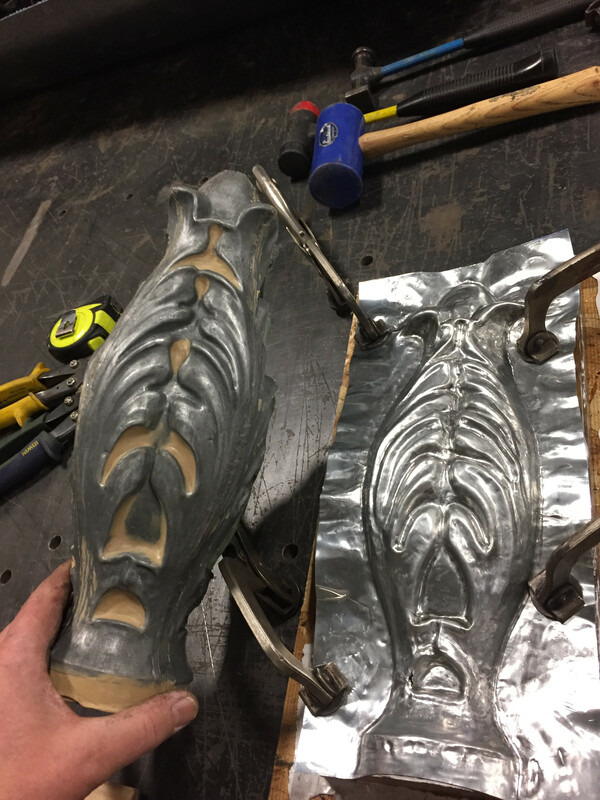 The tail has been burned off. 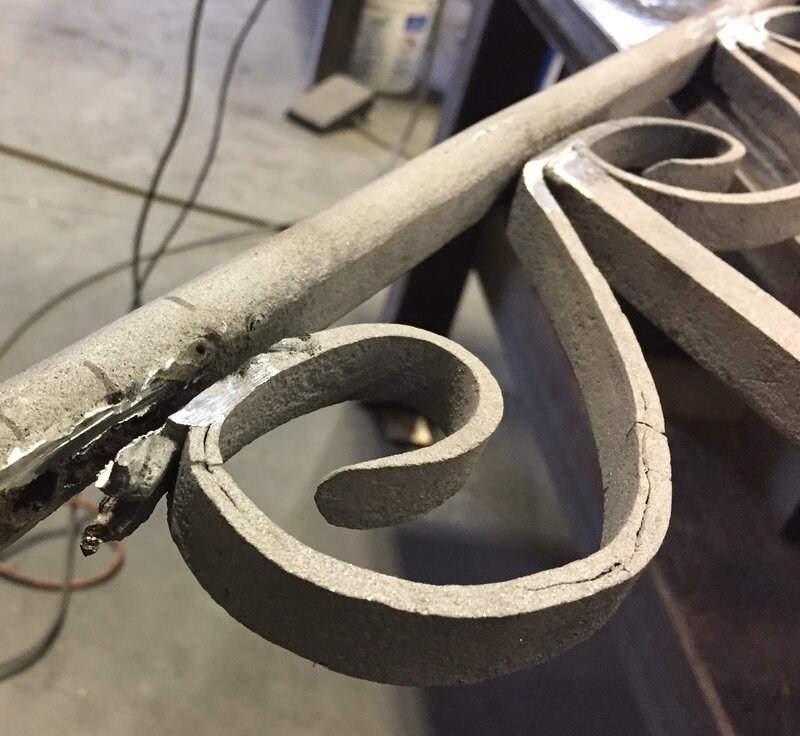 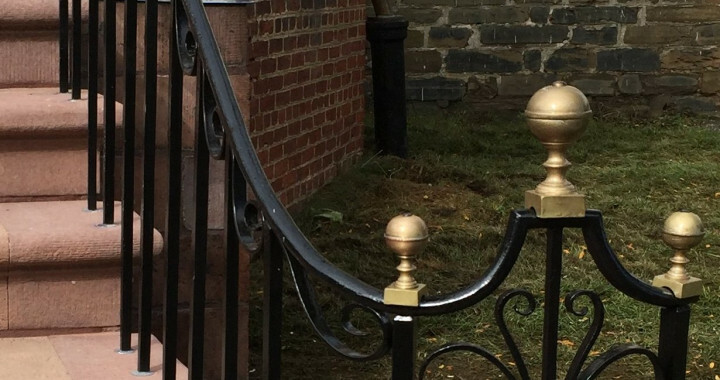 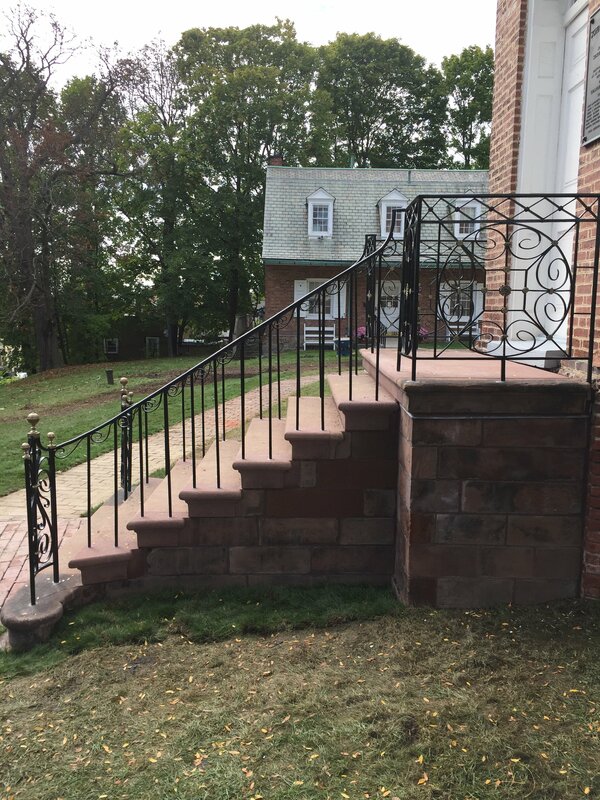 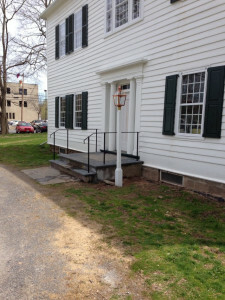 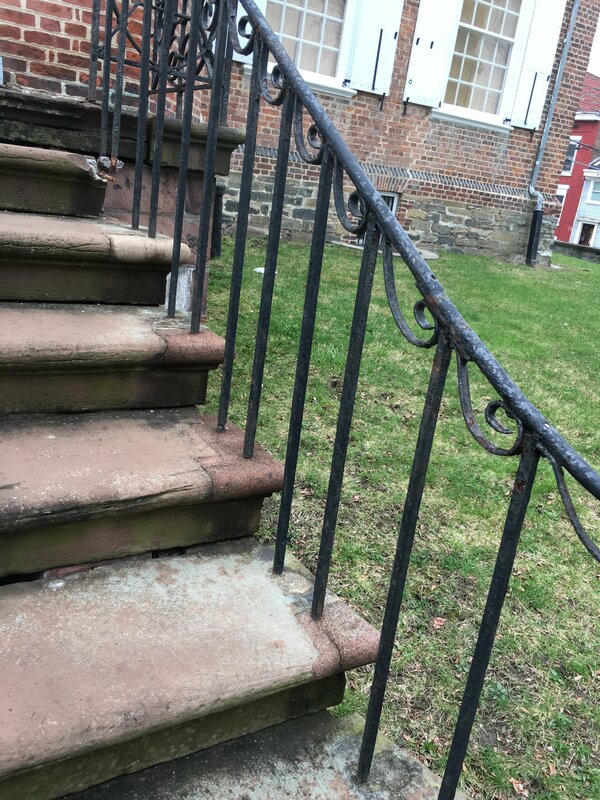 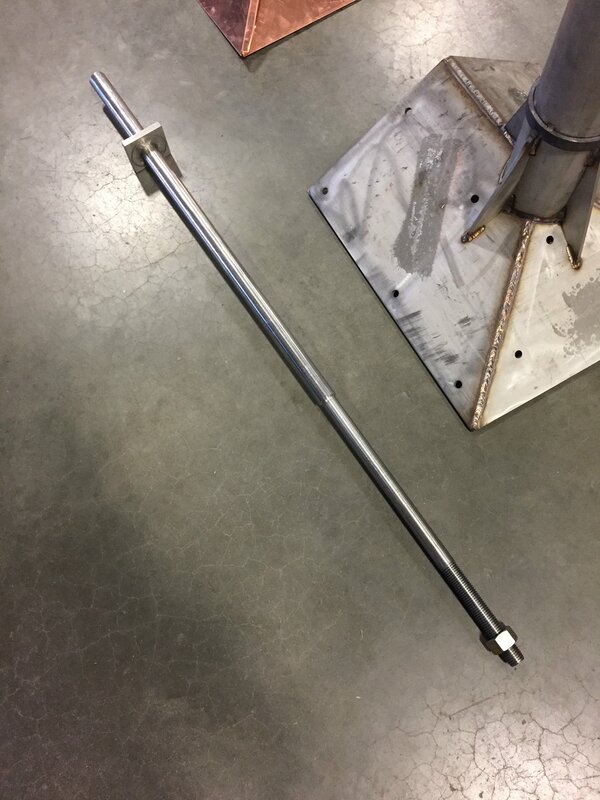 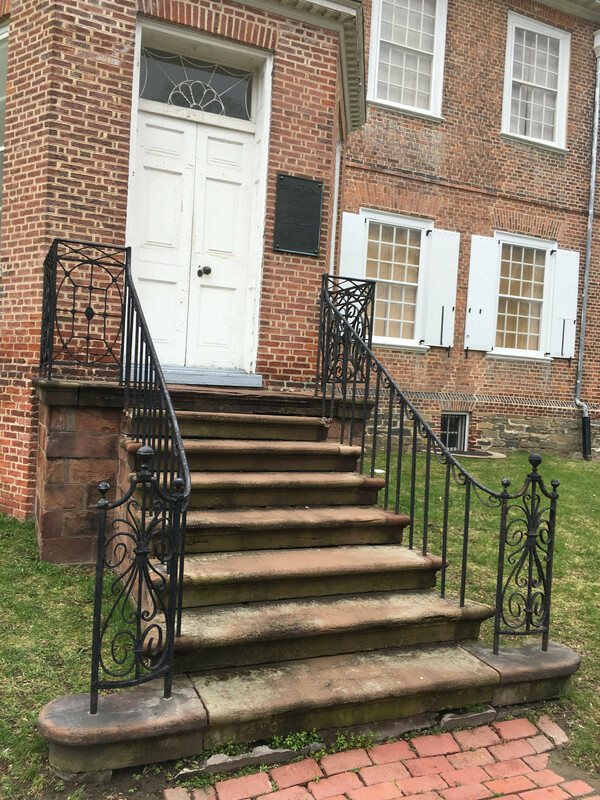 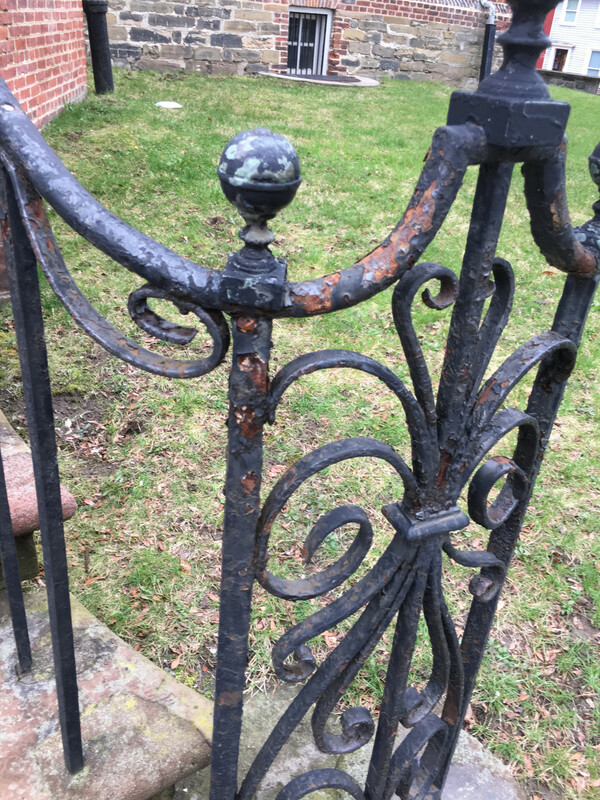 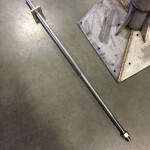 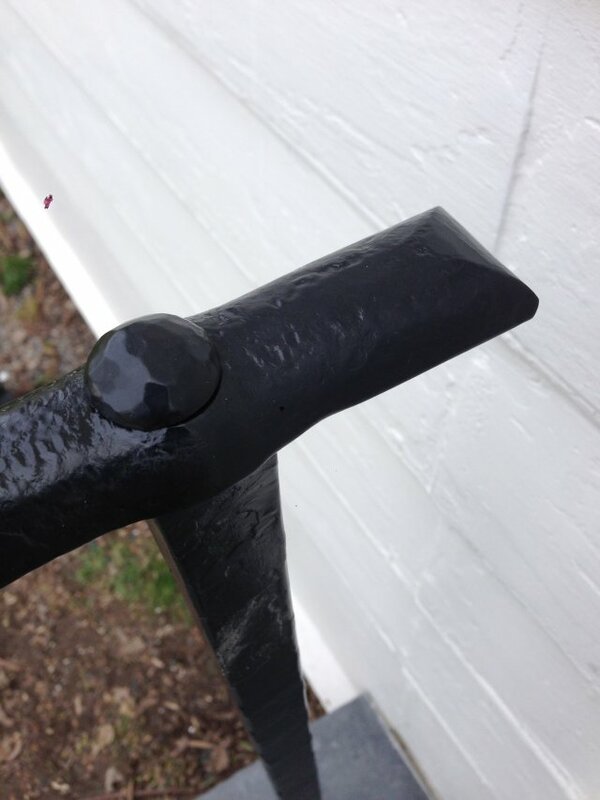 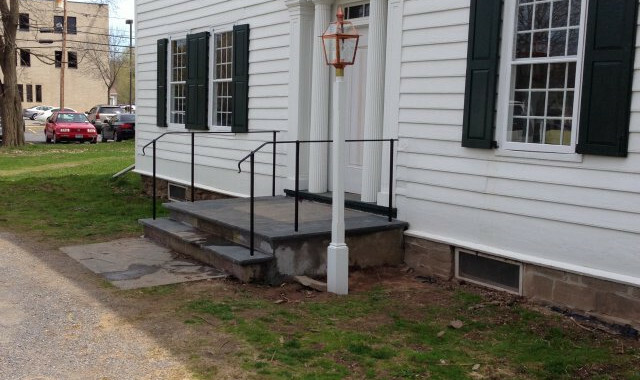 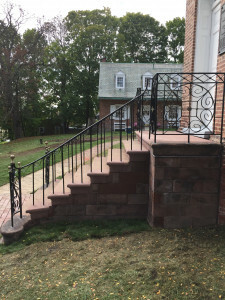 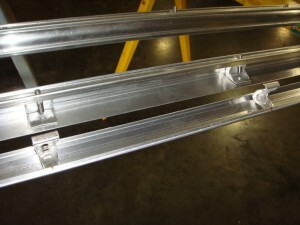 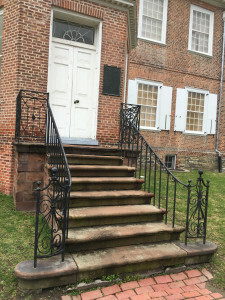 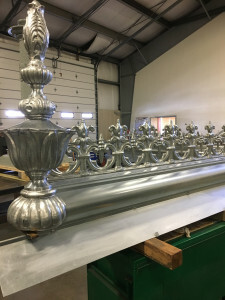 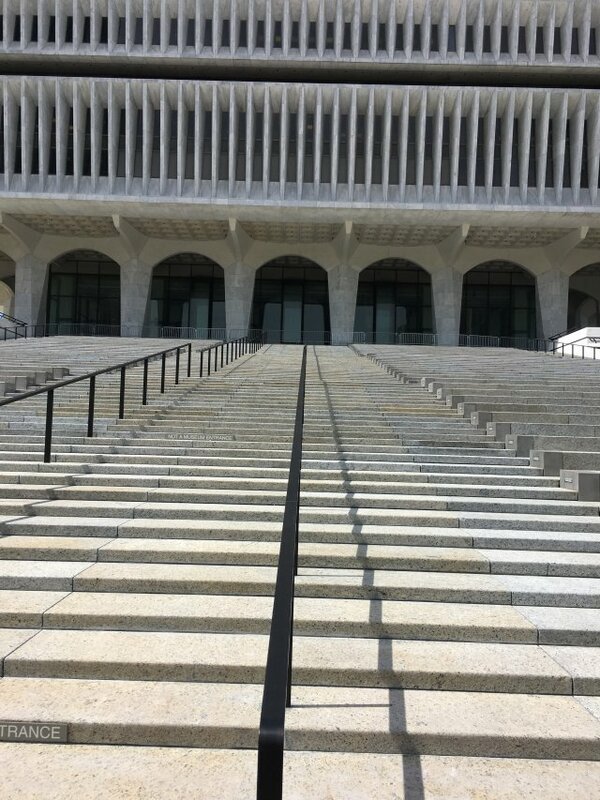 The scroll and picket were welded to the top rail. 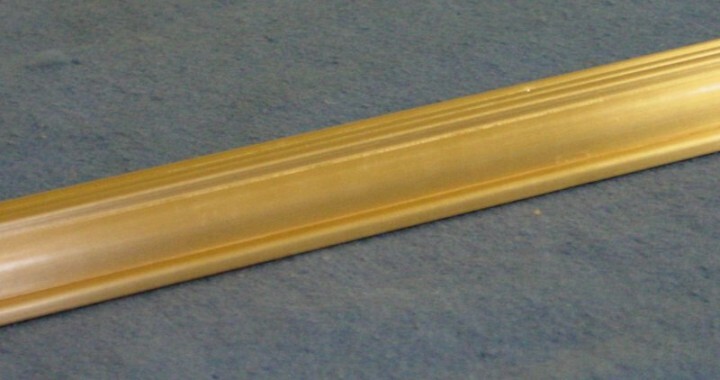 The scroll is deformed. 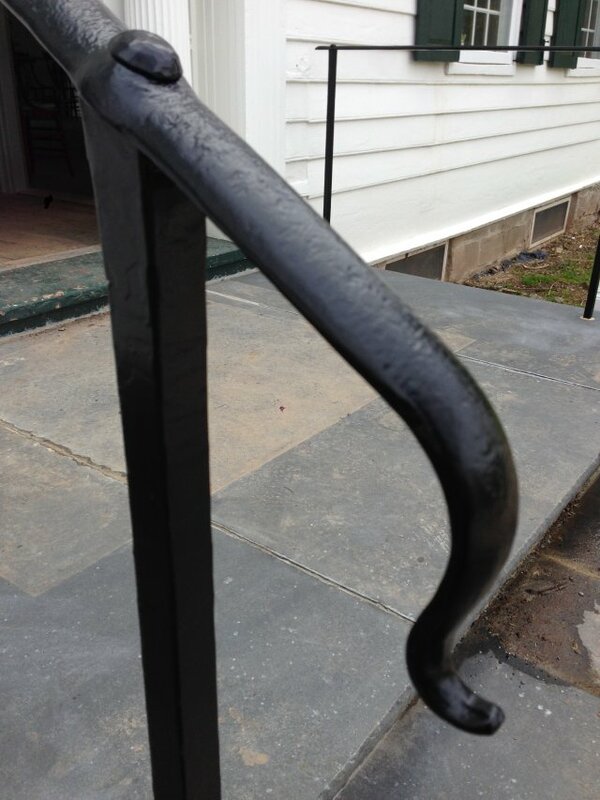 New scrolls are hand reproduced using the same blacksmithing and “forge welding” methods as the 1760’s originals. 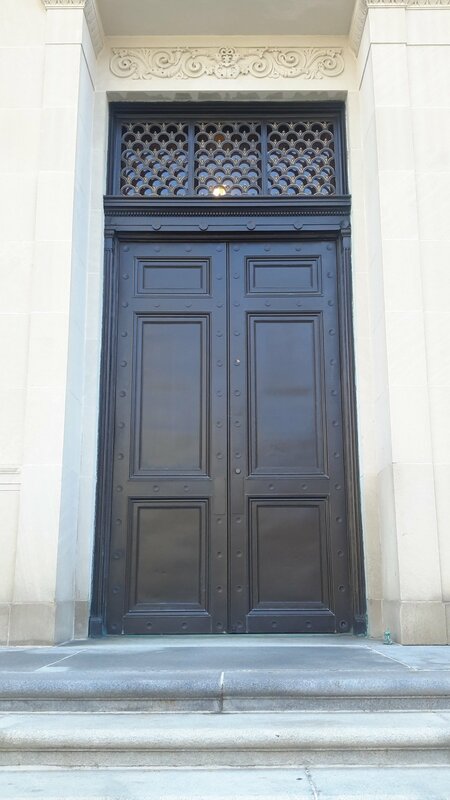 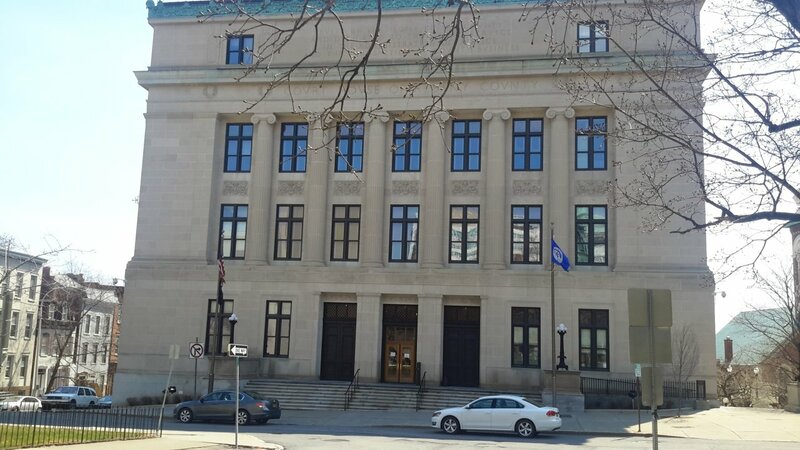 The restoration of 10 bronze kalamein night doors and frames required the removal of any damaged cladding, repairing of deteriorated wood substrate (replacing as needed), reinstalling cladding (replacing as needed), and repairing the hardware (replacing as needed). 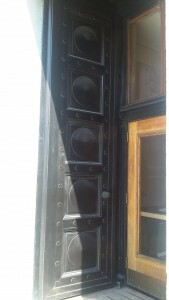 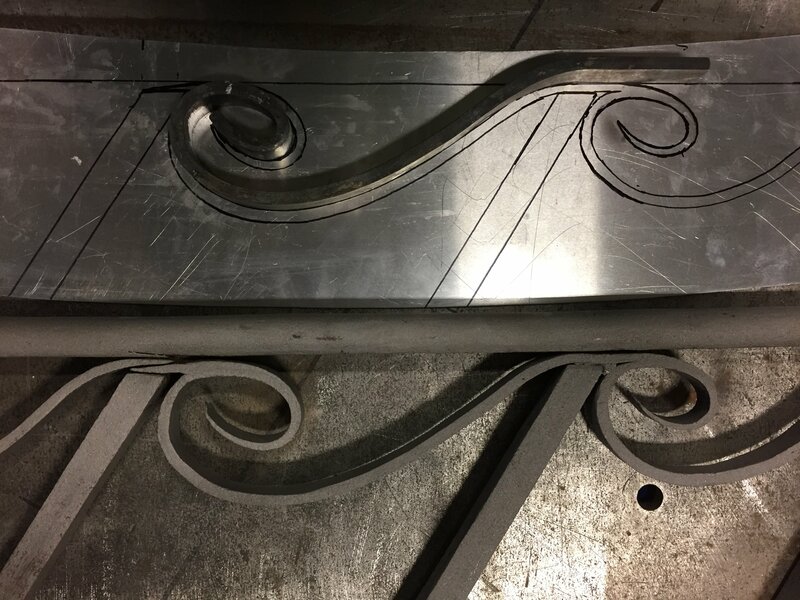 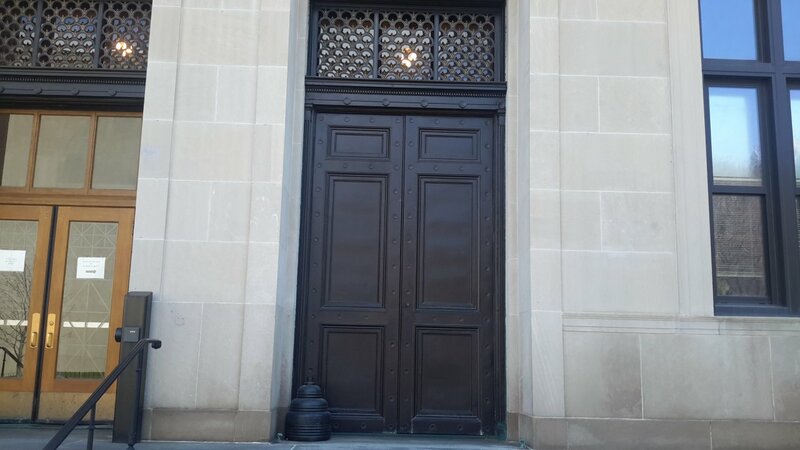 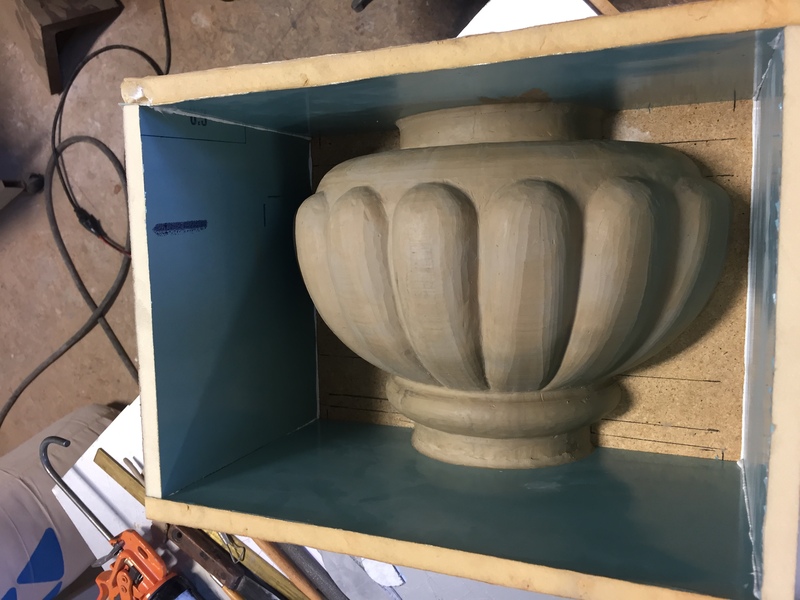 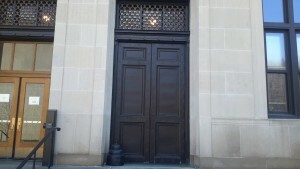 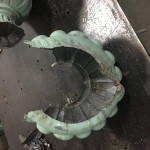 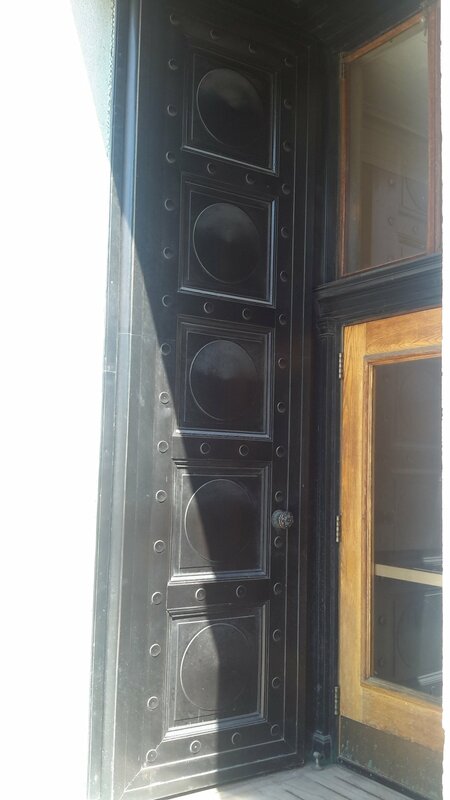 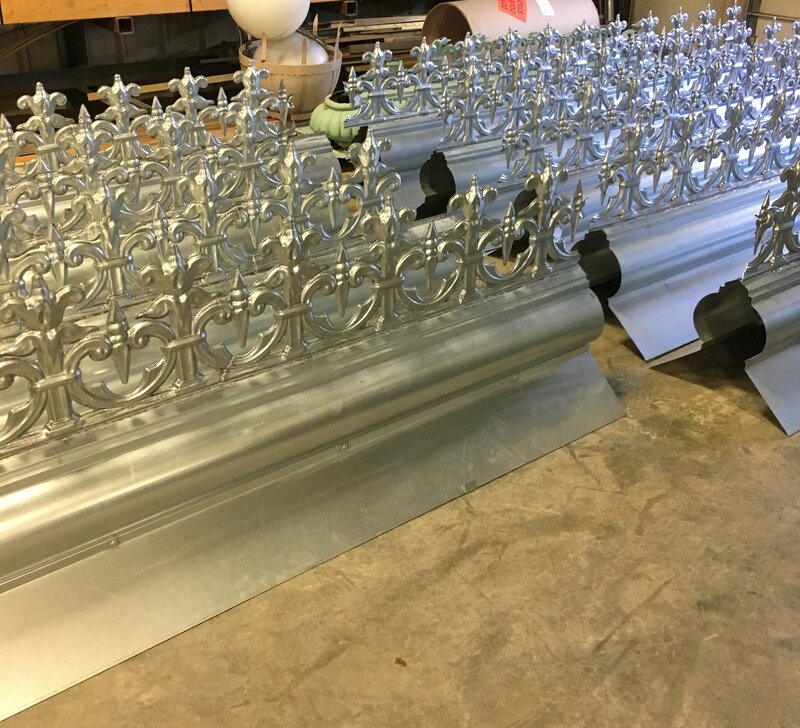 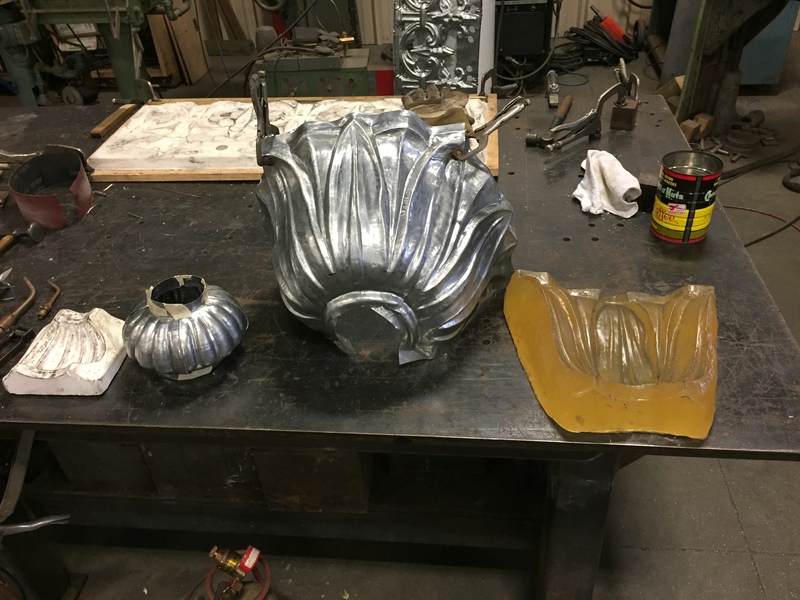 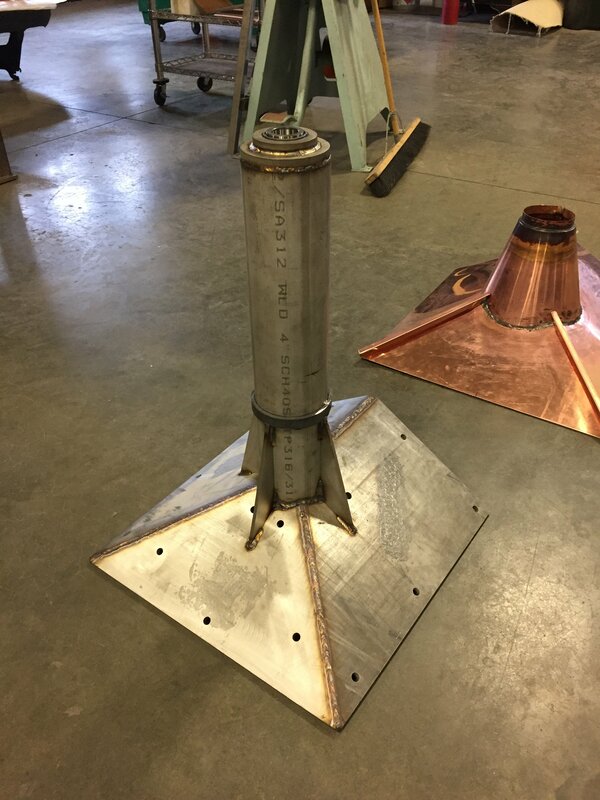 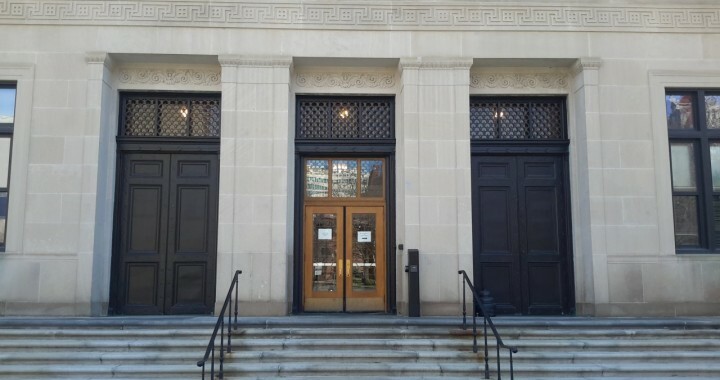 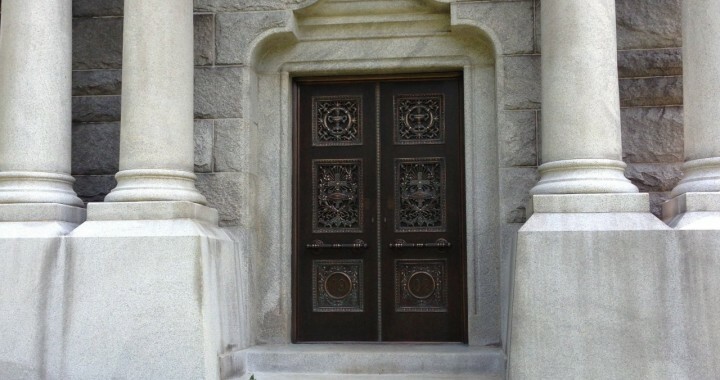 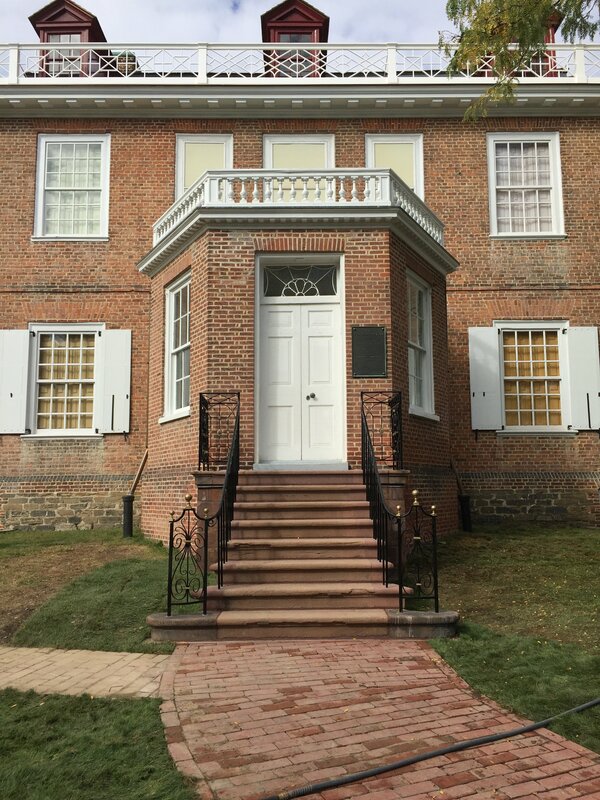 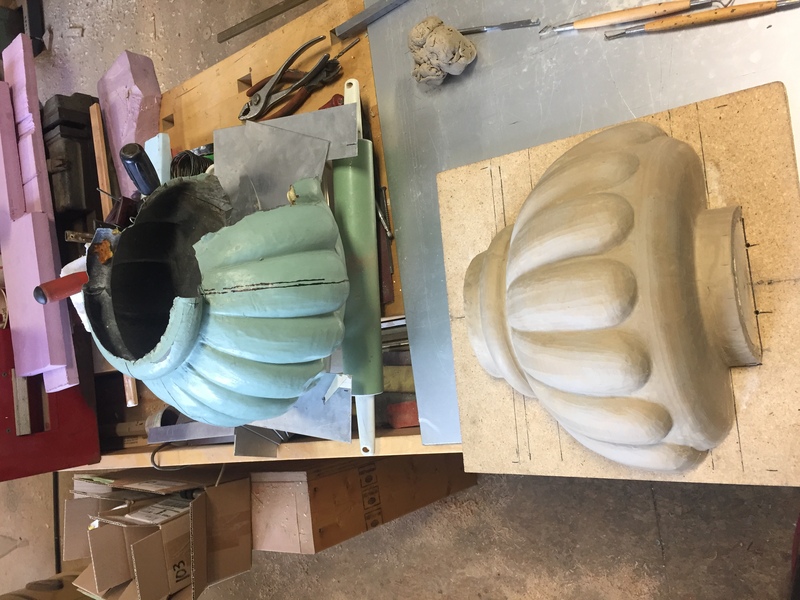 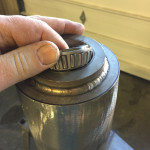 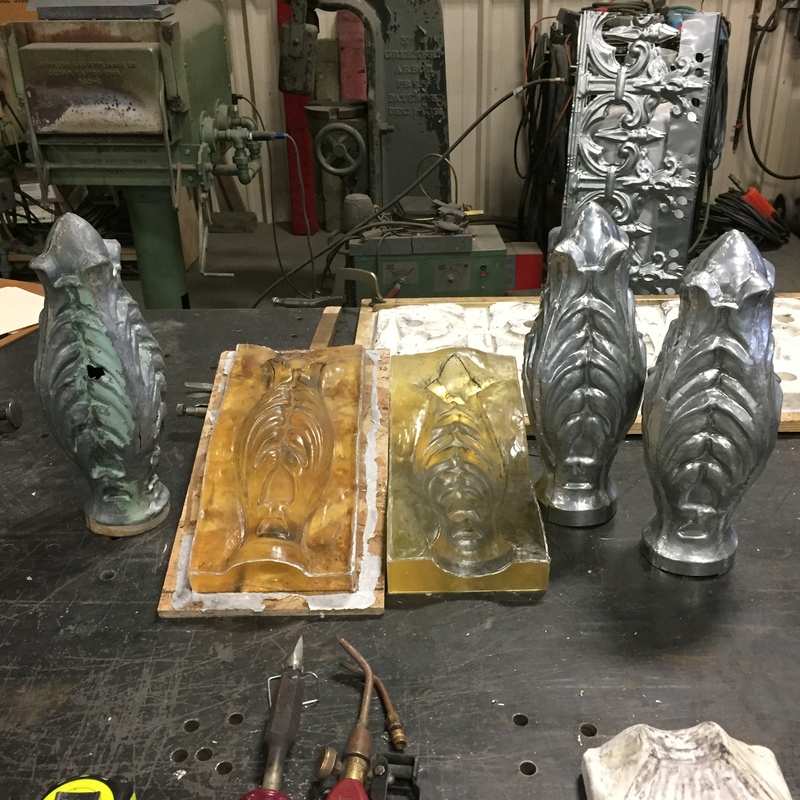 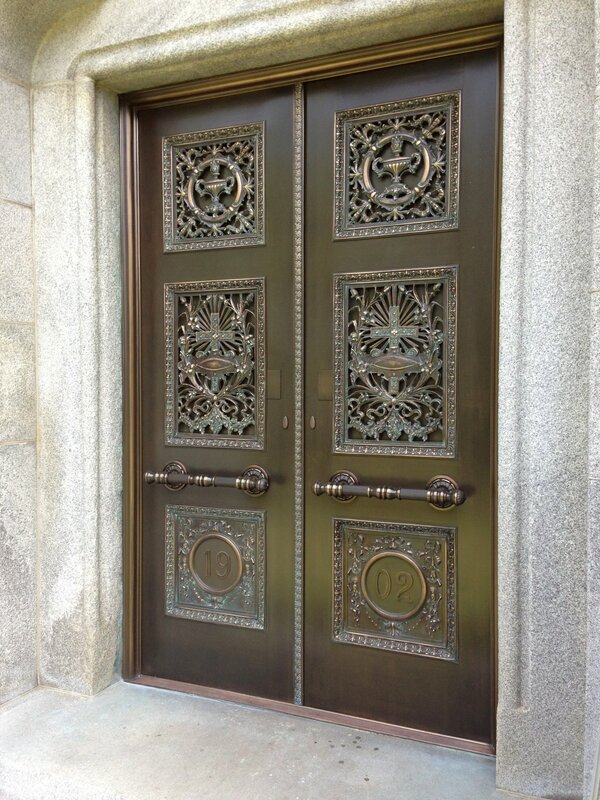 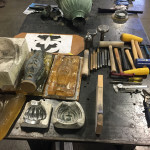 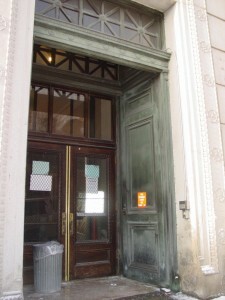 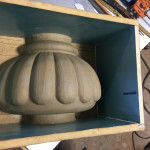 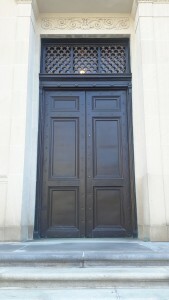 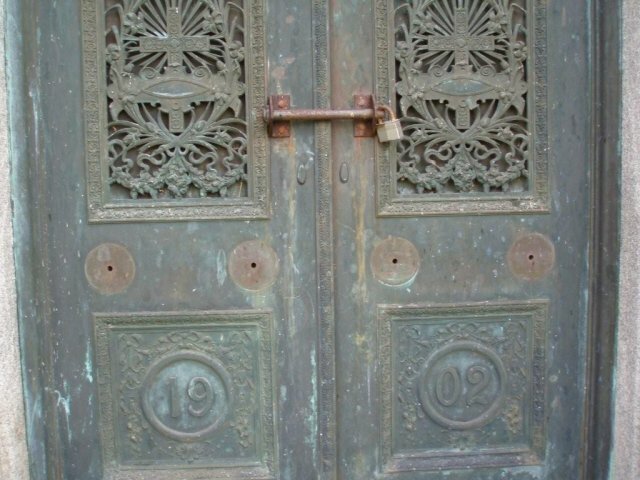 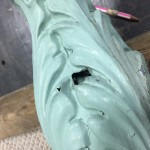 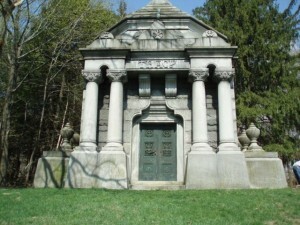 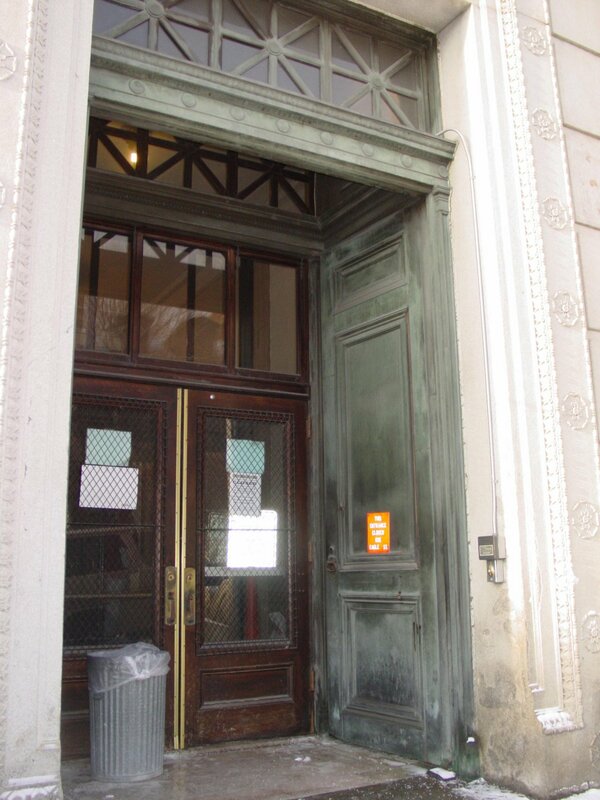 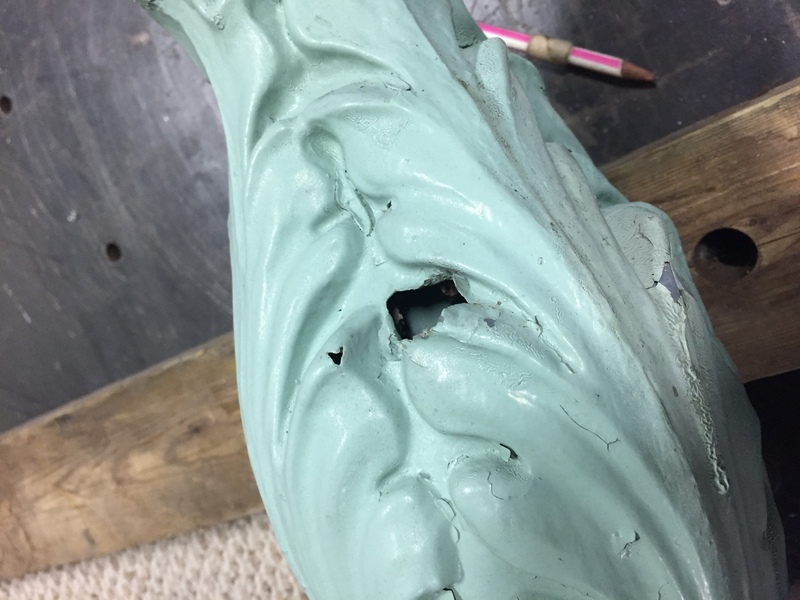 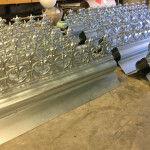 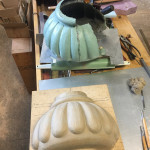 Job included repairing the doors by patching holes, rebuilding (and in some cases fabricating new) hardware, making new custom bronze door pulls and rosettes, making a new cast bronze grill to match the original, and refinishing. 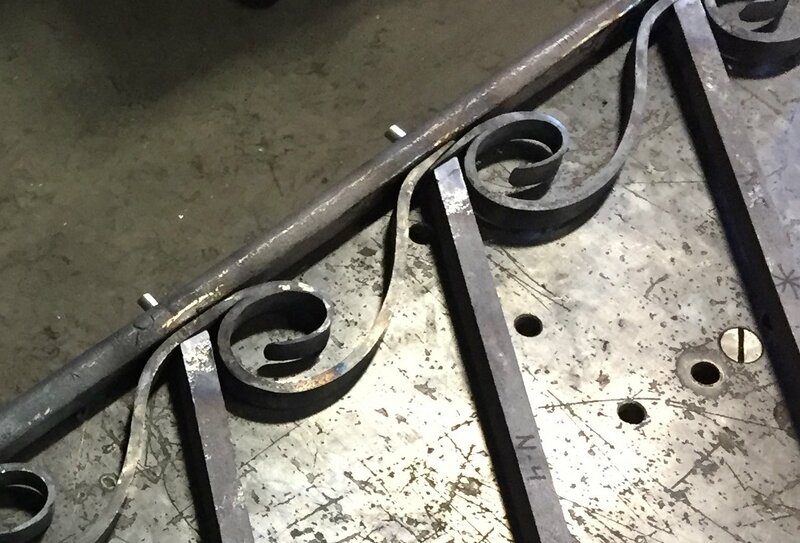 ©2015 Keicher Metals Arts, Inc., all rights reserved.